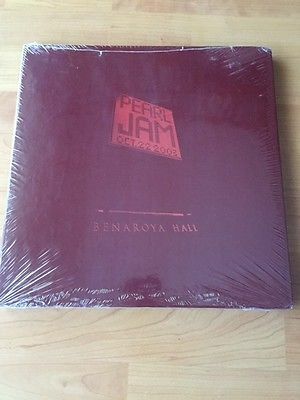 You are bidding on a rare, brand new, collectors edition colored vinyl box set of Pearl Jam Live at Benaroya Hall in Seattle, WA from 2003. This is copy 523 of 2000. This has never been opened, and is still in the original shrink wrap. It has been stored upright since it was purchased. This collection is very hard to find and almost never shows up new. I hope to send this to a good home where a true fan can appreciate it. Recorded live on the 22 October 2003, for the benefit of Youthcare. Limited to 2000 numbered copies, available through TenClub only. Includes a poster. Coloured 180grVinyl.